Have you ever wondered what it’d be like if the Doctor was in Ocean’s Eleven? Well that is exactly the kind of situation the Doctor and Clara found themselves in when they awakened with their memories wiped and instructions to rob the most secure bank in the galaxy. Though what started as a bank robbery turned out to actually be a race against time – across time – to save a species from going extinct. Along the way we continued this seasons theme of revealing the Doctor through juxtaposition with the antagonists as well as gained some new insights as to what is yet to come this season. 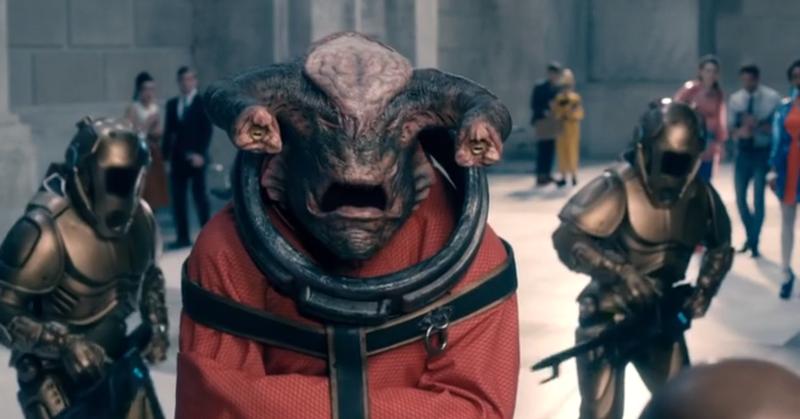 So grab your sonic screwdrivers and “Shut up, shut up, shutity up up up” because we’re about to go Into The Episode for Doctor Who “Time Heist”. In case you were a little confused as to how/why the heist played out the way it did, allow me to recap everything for you as simply as possible – if that’s possible for this show – and make this sequence of events less Pulp Fiction and more linear. The richest person in the galaxy, Karabraxos was on her death bed and remembered how the Doctor once gave her his number in case she ever wanted to right a wrong she had committed. She called the Doctor to tell him about her sins and how she was responsible for the extinction of an entire species. She had learned to control one Teller by keeping its mate captive as blackmail, and both would die in the ensuing solar storm that would destroy the bank of Karabraxos. In order to make up for this sin, she begged the Doctor to save the alien on this very specific day and time. With the tools and knowledge he needed, the Doctor knew he had to recruit a team with special skills as well as something to gain from robbing the Bank of Karabraxos. This is where he found Saibra and Psi a shape-shifting humanoid who wanted to suppress her powers and a cybernetic hacker who lost the memory of those he loved. Next, he would have to make a few quick trips in the Tardis to drop off certain items in the bank’s less impenetrable spots. With his team and everything else in place, the Doctor would then have to disguise his voice and plans and erase his team’s memories so that when they entered the bank, the Teller couldn’t sense their guilt, worry or any other thoughts that could give them away. Yes, the Teller could have sensed their desire to ‘help’ it; but the Teller was mentally connected to the younger – less remorseful – Karabraxos, who would have ordered their deaths anyway. Additionally, the ‘shredders’ left to help were thought to be suicide devices, this way Clara and the Doctor would think their teammates were dead and not just ‘teleported’ so they could regroup. With all of these precautions in place and their supply/escape ship lying undetected in orbit, they could carry out their mission. As for why they couldn’t just take the short way of popping the Tardis into the private vault on any other day to save the Teller, it seems as though this was impossible. The vault was locked from even time travel unless it was fully opened. The only time it was open was during the solar storm – which would render the Tardis almost impossible to control/land in such specific area. The long way was the only way. Throw in the Doctor giving the younger Karabraxos his number, and he would complete the circle so that the older could contact him once nearing death. We saw quite a few descriptions/comparisons to the Doctor this episode. From Psi’s comment about his “professional detachment” to the whole business with Karabraxos and her clones which might foreshadow ‘the man with the Doctor’s face from Fires of Pompeii” – more on that in a second -, there was a lot to see about the Doctor this episode. 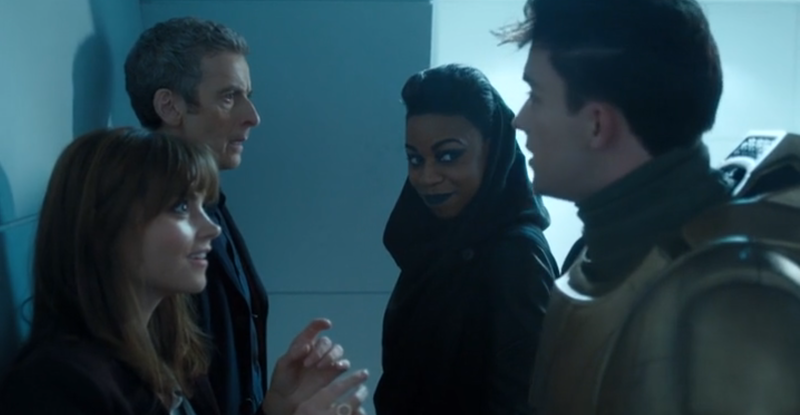 Though the most important juxtaposition was between the Doctor and ‘The teller”. Aliens of frightening powers and abilities, both the Doctor and Teller are thought to be the last of their kind. Though in reality we know they’re not. As we learned in the Day of the Doctor and the Time of the Doctor Christmas special last year, the Doctor is not alone. Just as the Teller was reunited with another member of its kind, so too will the Doctor eventually be reunited with his kind. Whether it’s reunited with all the Time Lords or a new form of The Master, the Doctor will not be alone for long. The other juxtaposition in this episode is slight; but definitely points to Karabraxos while echoing Saibra’s words: “How can you trust someone if they could look back at you with your own eyes”. The ‘difficulty to trust’ someone with your face doesn’t simply come from the fact that the person has your face; but also because we are usually our own worst critic. Think about it. If you suddenly came face to face with someone just like you, you’d think it was a lie. You’d think something wasn’t real. Another aspect of this could be how you are usually your own worst critic. If you focus on your worst qualities and are faced with ‘someone who stole your face’, how could you EVER trust that person staring back at you? This is why Karabraxos would off her clones; and this is why the Doctor inexplicably knew that he ‘hated’ the architect. The architect was the Doctor himself and the Doctor isn’t a fan of himself. He didn’t even have to come face to face with himself so imagine what will happen if/when the Doctor comes face to face with…. his own face. The Doctor might not have a ton of clones; but he knows his face is familiar. He is of course referring to Peter Capaldi’s last role in Doctor Who as a character in the episode, Fires of Pompeii. We know that ‘the man he took his face from’ will be addressed later this season so all of these ‘trust/face problems’ might come into play again if the Twelfth Doctor comes face to face with Caecilius. 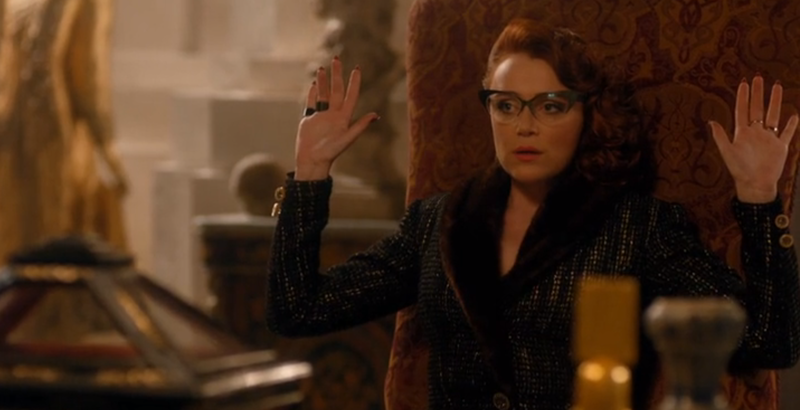 Hey I just met you, and this is crazy; but you’re a Time Lord. Time travel maybe? So we know Karabraxos got the Doctor’s number from him; but that hadn’t happened yet. At least, not to him it hadn’t. Either way, there is a few other people out there that has the Doctor’s number; and one of them is the same woman Clara originally got the Doctor’s number from. Could this the mysterious Missy? Is this someone the Doctor has already given his number to or is it someone he has yet to give his number too – like Karabraxos. We’ll have to wait to see just what this all means; but one thing is for sure: the Doctor should really be more careful as to who he gives his number out to. 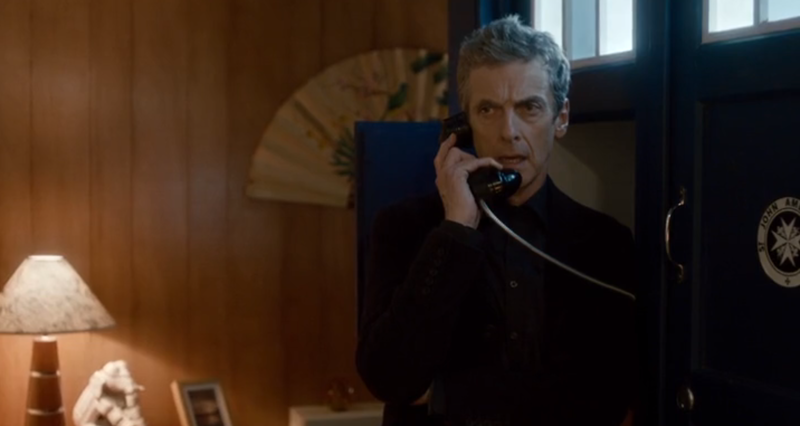 Now this doesn’t mean that the Twelfth Doctor is in love with Clara; but he is desperately afraid to lose her. 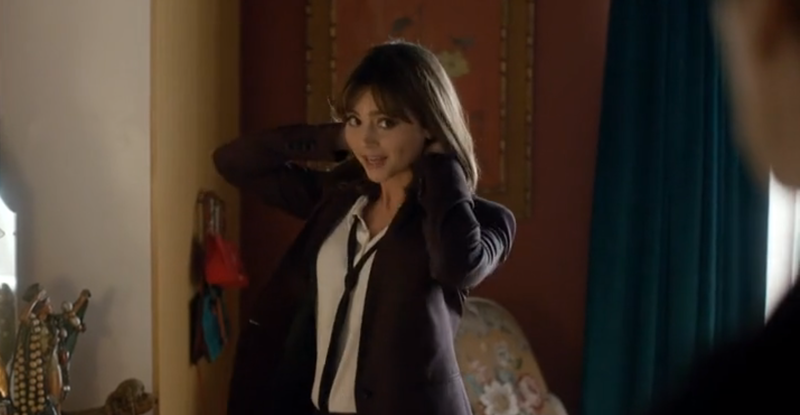 Remember what the Eleventh Doctor said when he called Clara, the new Doctor will be scared. Again, we saw this perfectly manifest in the last episode “Listen”; but very soon the Doctor going to start pushing Clara about this guy she keeps spending her time with – time that the Doctor thinks could be better spent going on adventures through time. The Doctor feels that he as the only important thing in Clara’s life; but in reality he knows the Clara is the most important thing in his. She is his ‘carer’; but not only in the sense that – as he put it a few episodes ago – she cares so he doesn’t have to; but also in the sense that he is kind of like her child. Though the Doctor is growing. The past few episodes he seemed a little un-Doctorly by choosing who to save and putting his companion in very dangerous situations; but he has been improving bit by bit. This episode more than any yet saw him as the good ole Doctor trying to save everyone at the drop of a pin. The Doctor is growing with Clara; but a conflict with Danny will arise soon – and judging by the previews, it’ll arise next week when the Doctor reassumes the name John Smith and starts working at Clara’s school. Omg, the Doctor is wearing a hoodie! This certainly wasn’t the best episode this Season; but it’s still better than most and keeps up this season’s quality thus far. There was also a very “Rings of Akhaten” feel to this episode when the Doctor tried to overfeed the Teller with ALL of his memories and stories – much like how the Eleventh did with that sun god who fed on stories. All in all, I still have to applaud this episode for keeping the seasons momentum while throwing in some great allusions to classic ‘heist’ movies.